(click on the link and select “Filming Rural History�? This video is the third in a series of videos produced to mark the turn of the century. In this video a blend of drama and documentary is used to convey you back to the early years of the last century. Items covered are those associated with the winter months in rural Ireland such as, harvesting and selling potatoes, threshing, the blacksmiths forge, and the traditional wake and funeral, amongst others. This video, as with volume’s one and two, is guaranteed to give hours of nostalgic pleasure. 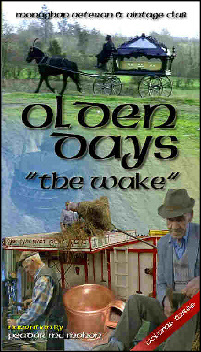 Recorded in the farmsteads and lane ways of mid Monaghan, and with informative commentary and beautiful traditional Irish music this video is a must for any one interested in the olden days.